For long-duration, deep space missions, astronauts will need a highly efficient and reconfigurable space, and Lockheed Martin is researching and designing ways to support those missions. The Lockheed Martin Habitat Ground Test Article (HGTA) Lunar habitat prototype is designed to accommodate a variety of missions around the Moon. Photos are courtesy of Lockheed Martin. Under a public-private partnership as a part of NASA's Next Space Technologies for Exploration Partnerships (NextSTEP) Phase II study contract, Lockheed Martin has completed the initial ground prototype for a cislunar habitat that would be compatible with NASA's Gateway architecture. This habitat will help NASA study and assess the critical capabilities needed to build a sustainable presence around the Moon and support pioneering human exploration in deep space. The full-scale prototype, or Habitat Ground Test Article (HGTA), is built inside of a repurposed shuttle-era cargo container, called a Multi-Purpose Logistics Module (MPLM), at Kennedy Space Center. 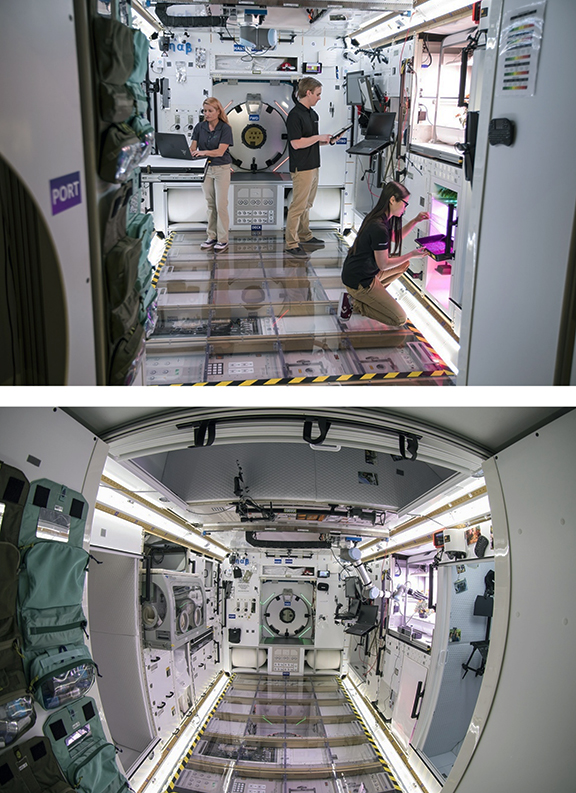 Using rapid prototyping and modern design tools such as virtual and augmented reality, the team customized the interior making full use of the entire volume of the module to accommodate a variety of tasks like science missions and personal needs of future astronauts. The team also studied how to apply the advanced, deep space capabilities that are already built in to NASA's Orion spacecraft. Through additional research and development funding, the NextSTEP team also applied mixed-reality technology to further refine the concept. Over the past five months, the team used tools like virtual and augmented reality to simplify and streamline the build-up process. They also applied expertise from Lockheed Martin's heritage of operating autonomous interplanetary robotic missions, like OSIRIS-REx and InSight, to integrate reliable robotic capabilities in to the design. The Lockheed Martin team will soon transition the prototype to the NASA NextSTEP team for assessment. During the week of March 25, a team of NASA astronauts will live and work inside the prototype, evaluating the layout and providing feedback. The NASA test team will also validate the overall design and will be able to evaluate the standards and common interfaces, like the International Docking System Standard (IDSS), and how to apply those systems for long-term missions based at the Lunar Gateway. Once NASA testing has completed, Lockheed Martin will continue to optimize and study the prototype to prepare for other Lunar efforts. Bill Pratt, Lockheed Martin Space NextSTEP program manager, said throughout the design and engineering process of this high-fidelity prototype,the company has kept the diversity of missions top-of-mind. By building modularity in from the beginning, the company's design can support Lunar orbit and surface science missions along with commercial operations, all while accelerating the path to the Moon. Returning to the Moon, and eventually Mars, is no small feat, but the Lockheed Martin Space team are mission visionaries — they have worked to apply lessons learned from the company's experience with deep space robotic missions to this first-of-its-kind spacecraft around the Moon.